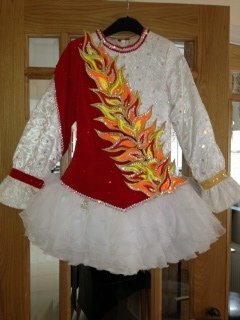 Stunning white and red Siopa Rince Dress just 10 months old. Selling reluntantly due to growth spurt. 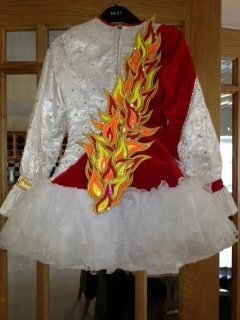 This dress has great stage presence with 3D flame effect design incorporating vibrant orange, gold, red and yellow embroidery. 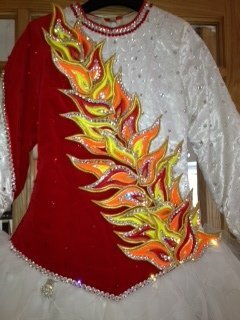 Embellished with various size swarovski crystals throughout the bodice yet holding the clean lines of the free-flowing soft chiffon ”fairy” skirt, composing of tule to keep its perfect shape. Suitable for age 12-13 years. It has been very well cared for, looking as new. 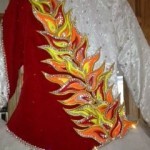 Also included kick pants, extra matching material and flames to make a headpiece. 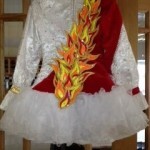 Asking Price: €850 ono. Shipping costs are not included in the asking price. Will accept returns and refund the cost of the dress, buyer to pay all shipping costs.